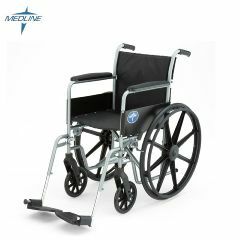 K1 Basic Wheelchair - 18" x 16"
Medline K1 Basic Wheelchair - 18" x 16"
The K1 Basic Wheelchair is constructed with a durable tig-welded frame in gray powder coat finish. Made with comfortable nylon upholstery with smooth-rolling, solid flat-free tires. Dual axle hemi-height adjustable and has a 300lb weight capacity. Use for patients in need. In case I need it this winter ! Getting around the house . I hope I don't need this, but when I do, It needs to be here. A little too high for me . I want to be able to use my feet to help propel myself along, and the seat is a little to high off the floor for that. If only using hands, quads get no use at all. What do you consider "hemi height?" How high from the floor is the seat at its lowest position? How mush does it weigh and do the leg rests come off??? Is the 18x16 inches 18 wide 16 deep or vice versa? can it be used for taking a shower? The material is waterproof, but it might get rather soggy, as some parts of the material are rather thick. I would get a shower chair; I think you would be happier. I don't have the right kind of scale, but as nearly as I can tell, it weighs about 50 lbs. What is overall total outside width of wheelchair? What is overall length, front to back, including push handles? Thanks. Total width is 25 inches wheel to wheel outside. The push handles are within the wheel base, overall length is 44 inches. does this wheelchair fold up for easy storage? This wheel chair folds-up to a narrow 12 Inches wide by 44 Inches long.